VAN BUREN, Ark. (CNS) — A marquee with a large yellow arrow sits on the lawn of St. Michael Church. Since January, two blessing boxes flank the sign, one filled with food, the other with hygiene and first aid items. The boxes also are a symbol that St. Michael is a community that lives out Jesus’ message. The 600-family parish hasn’t operated a food pantry but saw the unmanned “pantry” as a good alternative. 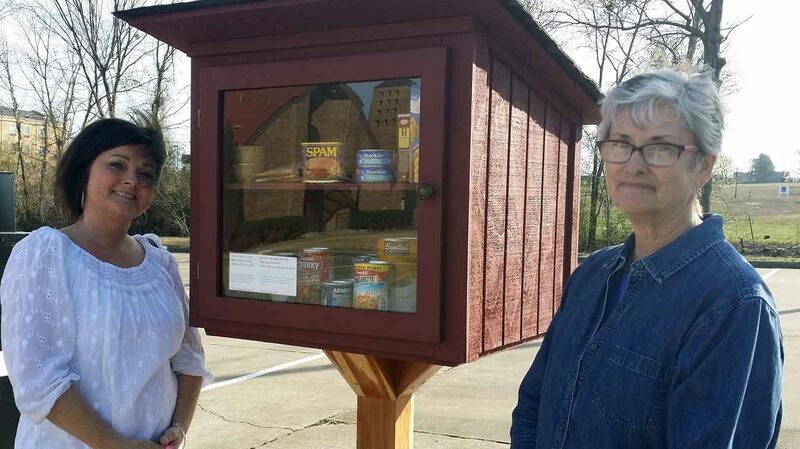 The blessing boxes are based on the Little Free Pantry project started by Jessica McClard at Good Shepherd Lutheran Church in Fayetteville in May 2016. Providing free food, drinks and personal care items is similar to the Little Free Library concept that now dots the country. Anyone can take whatever items they need any time of the day or night, but visitors are also able to leave items if they wish. Since the first St. Michael blessing box, built by Leonard Blaschke, was installed in January, the project has grown. Encounters with people using the box alerted parishioners to other ways they could help. Confirmation and religious education students held food drives. A second blessing box for hygiene and personal items, built by Dewey Woody, was installed. Woody has a team of parishioners helping with the project, including Betty Rose Neumeier, Emily Dickinson and Veronica Lane. One day a homeless man came to the church office and reported that the blessing box was empty. Woody gathered some food items into a plastic bag — Vienna sausages, cereal, applesauce, power bars and a plastic spoon. The encounter inspired Woody and Dickinson to make brown bags for people who came for an immediate meal. Woody adds a personal touch to the hygiene box by making and bagging homemade laundry detergent made with Borax, washing soda and shaved bar soap. The program is growing in the hearts of parishioners as well. Blessing boxes, known also as Little Free Pantry, are starting to pop up around the country in people’s front yards or churches. To learn more visit littlefreepantry.org. The boxes can be stocked with canned goods, drinks, personal care items and even school supplies. Meyerriecks is a correspondent for the Arkansas Catholic, newspaper of the Diocese of Little Rock.